A few months ago, I contacted Jonni for advice about the physical integrity of the paper mache pieces I’d been working on. No one wants to see months of work slowly rot from the inside out, so I turned to the person who’s work had inspired me to take my own approach to paper mache. During our correspondence, Jonni saw photo documentation of the process I was developing and kindly asked me to write a guest post for her web site. The idea is pretty straightforward: 3D elements based on a 2D surface. 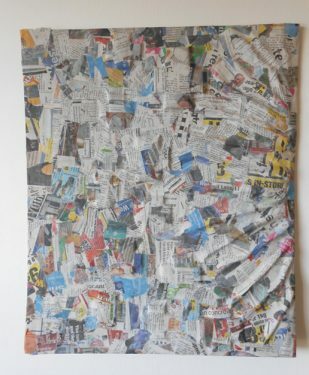 I wanted to develop a cheap, viable way to turn unwanted materials like cardboard and newspaper into art. 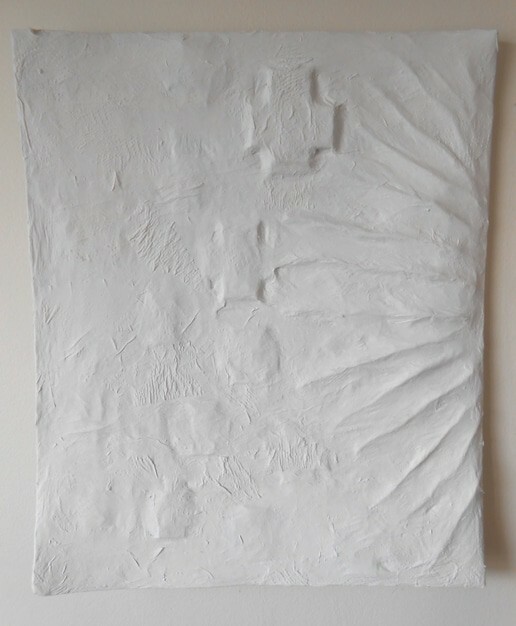 I like to think of it as canvas giving birth to form, but more simply, it’s paper mache sculpture that you can hang on the wall. After developing an idea and sketching, the first thing I do is select a base for the work. There is a local cafe that gives me large cardboard boxes-they’re sturdy and clean and would otherwise be left out for recycling. The tall boxes have nice rectangles to work with; I just take a box cutter to one of the sides and save the rest of the panels for future use. 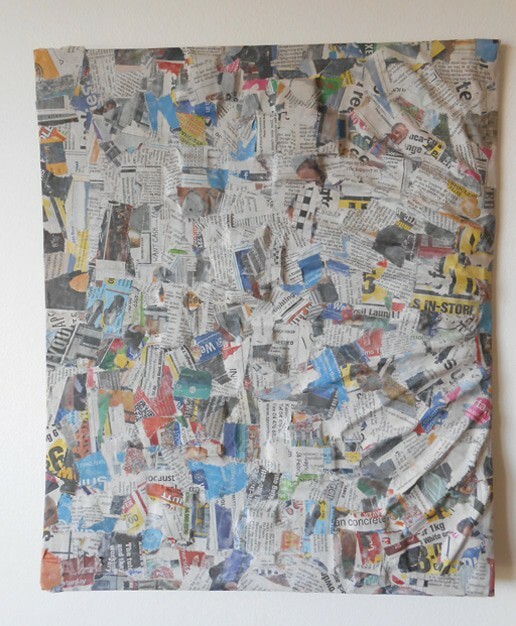 Next, I build the 3D elements using cardboard and newspaper. They are small, individual armatures that I fuse to the cardboard base with tape. When I’ve got them all fixed where I want them, I cover the entire surface with tape. Building the 3D elements using cardboard and newspaper. The piece is now ready for the cold or cooked flour paste and newspaper application. I prefer the cold flour paste recipes can be found here on Jonni’s site. 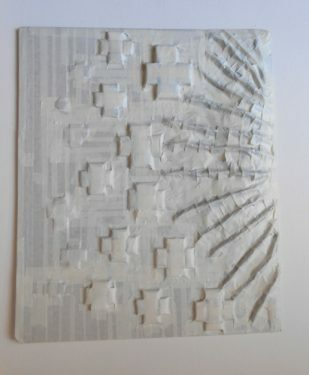 I do a few layers of application, using small strips of newspapers, allowing time for drying between each application. In the winter months I use a fan heater on a low setting to help with drying, or if it’s a small piece I stick it in the oven (also on a low setting). Next, I do a final paper mache layer using paper towels and cold flour paste. I like the different textures that can be achieved with the paper towels. Once it’s dry, I paint on a layer of white gesso. This can be purchased from an art supply shop, or you can make your own following Jonni’s recipe. After the gesso has dried, I start applying layers of acrylic paint. After the final layer of paint has dried, I do a final clear finish. You can use polyurethane or purchase a bottle of matte or gloss finish from an art supply shop. Because I am applying flour and water to cardboard, the base starts to warp after the first or second paper mache application. I happen to like the effect of the corners bending up, but to counteract it from warping too much I flip the piece over and weigh it down with heavy books for a few days (after the last layer has dried). While it retains a warped look, the back remains flat for mounting fixtures. This process is still very much in development, but I am happy to share it. I have Jonni and her amazing web site to thank for getting me started. Paper mache is a truly democratic medium, and it’s nice to know there is a strong community of people here with a genuine passion for it. 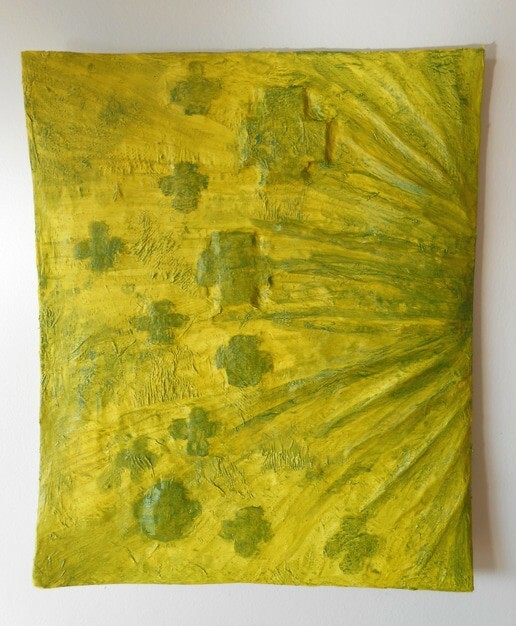 Hi Gennifer: I like your star paper mache piece, especially with the cross shapes indented…….I’m always a fan of texture. I was very delighted doing paper mache containers a few years ago and we used common white paste, diluted with water, to coat each piece of paper with. The forms we used were jars; boxes etc. and we wrapped them with ,,,,,,,,,,,,,, ; put on a layer or two of paper toweling, and, when they had dried, razor- cut them up the side to get them off the form, then patched the cut with strips of paper towel. Thanks for your post! What kind of tape do you use to cover the surface before applying the newspaper? This is an older guest post, and I don’t know if Gennifer is still watching the comments. It looks like she just used masking tape to cover the cardboard shapes. Her paintings do warp, but she likes that effect. I need to put cardboard spacers between multiple layers of my three-dimentional paper mache wall art. I’m wondering if I have to seal the cardboard before doing that? I will be sealing each mache layer of the piece with spray glaze and closing the ends with paper clay, but I am concerned that the cardboard might hold moisture or otherwise create problems down the line. Anyone have any thoughts? I’m afraid I don’t have an answer for you, Cheryl. You might get more responses if you put your post on the Daily Sculptors page. More readers subscribe to that page. Oh so nice! I like it so mutch. Greetings from Germany! It has the look of a drywall art….Very pretty. Paper & board will warp because of unequal expansion of the fibres in different orientations when wetted.To mitigate this one can add another layer of the same paper or board orientating it at right angles to the first. The idea being that the expansion & contraction in one direction of one piece is balanced by an equal expansion & expansion of the second piece in the opposite direction. This is acommon problem for bookbinders. Warping happens when one side swells more than the other when you get it wet. With watercolor paper, you soak it before you start, and you still fasten the edges down with tape to keep it from buckling. I don’t suppose the cardboard would hold up to that, though. I make a pulp of paper with water, keeping it fairly wet, add glue…and then add plaster paris. You have to work pretty quickly to shape it into a round.. or oblong, or rectangle, what-have-you. The edges mold nicely with some spatula pats 🙂 I pour it out on coroplast..which is the corrogated signboard used for yard signs.. it comes up to 4×10′ sheets 🙂 The mache ‘plaque’ doesn’t stick to it when dry..well.. you might have to pry it a little..but it seperates.. comes off better if you wrap the signboard with plastic wrap. I got tired of the base cardboard curling.. and just laying striips of paper down worked, but it took forever for larger plaques.. I’m doing mostly 3’x1 or 4×2 ish ones. It occurs to me that building your layers onto any scrap of plywood, or masonite panel, would keep it flat, if that mattered enough to deal with the extra effort of finding such things. 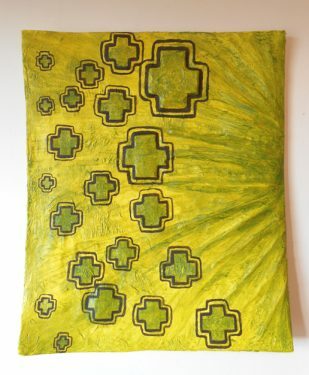 Pretty inexpensive panels can be bought in standard sizes from art supply places, but scraps might be found at dumps or building sites or cabinetry shops. 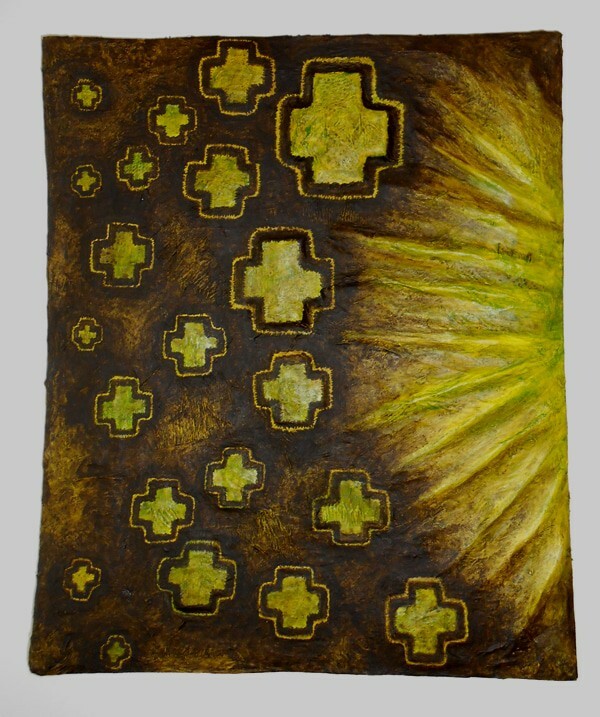 Alternatively, the cardboard-based paintings could probably be glued to a panel, if you wanted to, later. How do you work out the hanging apparatus on your pieces? Thanks for sharing! Xan, I’m not sure that using a wooden board would prevent warping – when one side of a flat thing is wet, and then it dries, it seems to exert enormous pressure to warp. We need a physics professor to explain why (I have no idea). But Tani said that you can avoid warping, if you want to, by using gesso and sealing the cardboard first. Personally, I rather like the organic look that Gennifer is getting by allowing the piece to warp. It gives the piece a soft shape that would be hard to get any other way. Hi there. To hang the pieces, I glue four slender wooden rods to the back. I use unwanted scrap wood, but you can buy the long skinny wood trimmings at the hardware store and cut it to the lengths you need. 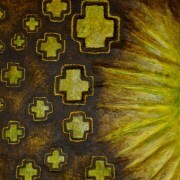 Once the wood is set, you can hang it just like you would a traditional art canvas (i.e. mounting nails, string and hooks). In my next piece, I plan to staple my base to a wood frame–it probably won’t have a chance to warp; I am curious to see what will happen. I like this idea! Now my brain is flying around thinking of things to design! Thank you for sharing! Love your idea. I also liked using paper and cardboard to up cycle into art….I have found adding a couple drops of oil of cloves works to “preserve” it.